Dell Perc H200 Raid card. 8GB DDR3 ECC. This is for both our protection and yours. Everything is fully tested unless otherwise stated. MODEL NUMBER T110. HDD No HDDs. PRODUCT LINE PowerEdge. MANUFACTURER Dell. OPTICAL DRIVE DVD-RW. Rapid IT's highly trained staff each have their designated area of expertise, so should you need advice or assistance you know you'll be getting the best possible help. DELL PowerEdge T110 Computer. 2X 500GB Hard Drives. Standard (Shows 1GB total storage 2X 500GB). Mirror Raid (Shows 500GB storage). 2X DVD Writers. DOES NOT INCLUDE MONITOR. Tested with Windows 10 pro. Cleaned throughout new thermal paste applied and new bios battery. Great system and good expansion potential, storage, ssd, cpu and ddr3. Peripheral Card/s. WINDOWS 7 (COA). DVD-Rom Drive. No hard drives supplied with this server. All hard drives are fully tested by performing a HMG Infosec Level 5 wipe on them. This is for both our protection and yours. Everything is fully tested unless otherwise stated. Storage: No HDD attached. Optical Drive. Server Specs. · Warranty covers any hardware defects under normal use during the warranty period. If the sticker is removed warranty is void. This item is covered with 3 years warranty. In any case, make sure you do not remove the warranty sticker from the item. Perc H200 Raid Card. 8GB DDR3 ECC. This is for both our protection and yours. Everything is fully tested unless otherwise stated. This is a powerful Server that has been processed through our system. The full specification is detailed below. About This Server TFT Monitors. Tablet PC's. Servers & Components. Professional Audio / Visual. In excellent condition as pictured! Model:PowerEdge T110 II. ComputeUK - Suppliers of new and used Computer and IT related products. Tested, Fully Working. Model:PowerEdge T110. ComputeUK - Suppliers of new and used Computer and IT related products. Tested, Fully Working. DVDRW Drive Fitted. DELL POWEREDGE T110 SERVER, 2.4GHZ INTEL XEON, X3430 CPU, 8GB RAM. NO HDD. In excellent condition! Dell power Edge T110 II Server Monitor And Keyboard. Professionally refurbed. See picture for full spec V good condition. This item has been fully refurbished by our qualified technicians, and has passed all diagnostic tests. In the unlikely event that something should go wrong, we offer a no-quibble, 90-day return to base warranty. .
Dell T110 Server used but in good condition, has a quad core Xeon 3400 series processor, 16gb of RAM and 8tb of SATA storage. Processor - Dual Core Pentium G6950. Hard Drive - 250GB. LM 157300 - NWP. Dell Poweredge T110 II server (entry), monitor, keyboard cables etc. Dell support link always available at Dell uk website, just type in model. Windows server Essentials 2012 R2. Bios updated to March 2018. DellPowerEdge T110 II 4GB RAM, No drives included. Condition is Used. 4gb (2x2gb) ram. while cleaning it i removed the multi hdd addapter too. as i want to keep that. i used this pc server for a while up until i upgraded recently. i cleaned the processor of thermal grease and added new thermal grease so it should be near enough ready to go. 2 x 500GB Sata Hard Drives in RAID 1. DELL SERVER TOWER IN FULL WORKING ORDER. INSTALLED UBUNTU SERVER WORKS FINE. HARD DISK DRIVE DATA WIPED. ITEM NOW DATA WIPED. INSTALLED WIN 10 TRIAL TESTED WITH DECENT SPEC CARD NOW REMOVED WORKS FINE. Dell PowerEdge T110 Desktop Server. Two Dell Enterprise 250GB Hard Drives in RAID 1 (Perc Raid card supports 0 also). 4GB DDR3 ECC (2 Dimms) 2 Slots Free. Compatible with Server 2003 to Server 2016 (Tested on Windows 7 Pro also use the Matrox server 2008 R2 Video driver) will also need Dell Perc Raid driver for Windows 7 installer to see drives if using RAID. Dell PowerEdge T110 ii Intel Xeon E3 1220 V2 - 3.1 GHz 8GB RAM No HDDs - removed from system Windows Small Business Server (SBS) 2011 license. SERVER ONLY - 1 x XEON E3-1220 V2 - 4GB RAM - NO HDD - SLIGHT CRACK IN TOP LEFT CORNER OF CASING - DOESN'T AFFECT USE. 2.0GB DDR3. Cracked top. USB Ports: 2 front and 4 back. Onboard Video. DVD RW Optical Drive. Let employees work simultaneously by moving to a server-based network. You are buying a used and faulty Dell PowerEdge T110 Server base unit. It is based on the following specification:-. This motherboard also has 2 standard USB ports which can only be accessed from inside the server case. Dell T110 Server used but in good condition, has a quad core Xeon 3400 series processor, 8gb of RAM and no storage. 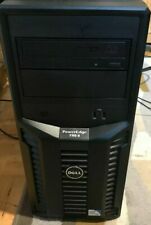 Dell T110 Server used but in good condition, has a quad core Xeon 3400 series processor, 16gb of RAM and 2tb of SAS storage. 8GB DDR3 ECC. This is for both our protection and yours. Everything is fully tested unless otherwise stated. Model:PowerEdge T110. Couple Of Scratches On The Casing. H200 RAID card with all cabling for upto 4 x SAS HDDs. 1 x 300GB 15k SAS hard drive. Tower server with Xeon CPU. We've moved on to the cloud and don't really require the use of this server any more. It has been brilliant for us. Model:PowerEdge T110. ComputeUK - Suppliers of new and used Computer and IT related products. Tested, Fully Working. No DVD Drive. No hard drives supplied with this server. This is for both our protection and yours. Everything is fully tested unless otherwise stated.